Neutrophils, also known as neurocytes, are a type of white blood cell that is central to our immune system. 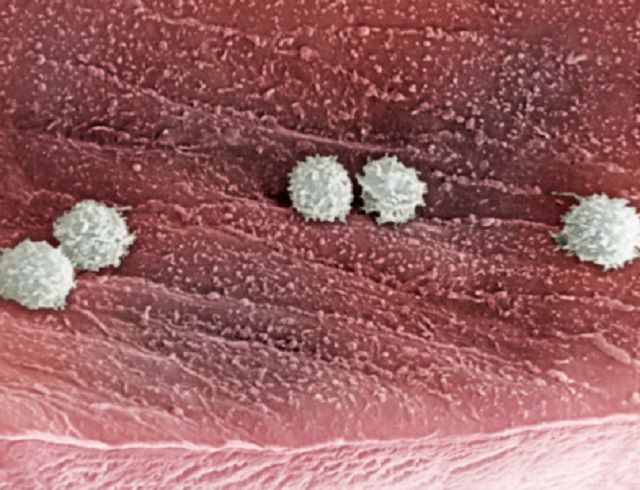 As part of our innate immune defense, neutrophils act as the first-line responders to infection, attacking bacteria, viruses, and other pathogens. Neutrophils can also be referred to as phagocytes (phago- meaning to eat and -cyte meaning cell) as they protect the body by ingesting invading organisms. They are produced in the bone marrow and account for around 50 to 70 percent of your total white blood cells. As a defensive immune cell, neutrophils have a high motility (meaning the ability to move spontaneously) and are able to surround an infective agent to killing. In addition to ingesting the pathogen, neutrophils can release cytotoxic (cell-killing) substances that directly neutralize the organism. Neutrophils are able to find their prey through a process called chemotaxis wherein they recognize the chemicals released by a cut or scrape and move toward that "scent" automatically. This is unlike the second-line adaptive immunity which produces cells tailored to kill that pathogen and that pathogen alone. Innate immunity, by contrast, kills non-specifically, attacking anything that doesn't "smell" right. Neutrophils respond to infections both inside the body and on the surface of the skin. Pus, one of the byproducts of a skin infection, is mainly comprised of dead neutrophil, bacteria, and skin cells. Neutrophils are counted as part of the complete blood count test (CBC). Another test, called the WBC differential, outlines the percentage of each type of white blood cells in a sample of blood, including neutrophils, lymphocytes, monocytes, basophils, and eosinophils. Meanwhile, the absolute neutrophil count (ANC) tells us how many of these cells are in the blood with a "normal" reference range of between 1800 and 7800 cells per microliter (mL). A high neutrophil count, known as neutrophilia, can be caused by any infection, trauma, or inflammation that spurs the immune system to action. Neutrophilia is common with appendicitis, serious burns, certain types of leukemia, and any condition that causes acute inflammation (such as a heart attack). By contrast, a low count, known as neutropenia, may be caused by sepsis, chemotherapy, radiation treatment, and certain autoimmune disorders. In some people, neutropenia can be chronic (ongoing and persistent) while others will be transient (usually in response to a disease or drug exposure). Mild neutropenia (ANC under 1500 cells/mL) which carries a minimal risk of infection. Moderate neutropenia (ANC between 1000 and 500 cells/mL) which poses a moderate risk of infection. Severe neutropenia (ANC under 500 cells/mL) which poses a severe risk of infection. If the ANC drops below about 500 cells/mL, your doctor will likely prescribe medications to better normalize neutrophil levels and may also offer a course of antibiotics to prevent serious infection. Treffers, L.; Hiemstra, I.; Kuijsper, T.; et al. "Neurophils in Cancer." Immunol Rev. 2016; 3273(1):312-28.